We ran across the bridge with our hands in the air, doing a victory chant full of excitement and relief. My friend, Anna, and I were on our normal run and ended up getting lost among the mansions of Ann Arbor. An hour and some change later, we arrived back at our cars so excited that we 1) made it back and 2) ended up getting in 8.5 miles on a week night (even though it was accidental). However, the excitement quickly dissipated when we realized that Anna's car window had been smashed in, all of her belongings taken. No phone, no purse, no shoes. The glass was all over her car, scattered across the pavement. It had just gotten dark outside, and the park's parking lot was barely lit. There were two other runners behind us, who simply got in their car and left, without a word. My coping mechanism for stressful situations is to laugh and make jokes, when internally I'm FREAKING out. It was a scary situation, but made worse thinking about the "what if's." If you exercise outside, running, biking, walking, then you know the story. You may get dogs barking, drivers not slowing down, or maybe slowing down a little too much, or random people yelling ridiculous things out the window (like they really believe that it will get you to flash them). All of that is pretty predicable, you wave it off and go about your business. However, there are other situations that are expected. How do you prepare? It really comes down to being prepared and being aware. There's bound to be a situation that comes up that you don't expect. The park we were at is surrounded by gorgeous homes, trails and a river- Not a place you'd ever expect something bad to happen. But alas. Hopefully this will help you enjoy running more, knowing you're prepared for any situation! That is so scary! I always feel paranoid about things like this happening, but it's better to be safe than sorry! Glad you and your friend are okay. My safety tip: I have a clip on keychain mace to attach to a running belt since I sometimes run at night. Makes me feel a bit more secure! I love the clip idea too. I should make my way to a running store and find all of the latest gadgets for safety! Someone else mentioned a Road ID, which makes total sense, way more useful than a regular ID if there is an emergency. 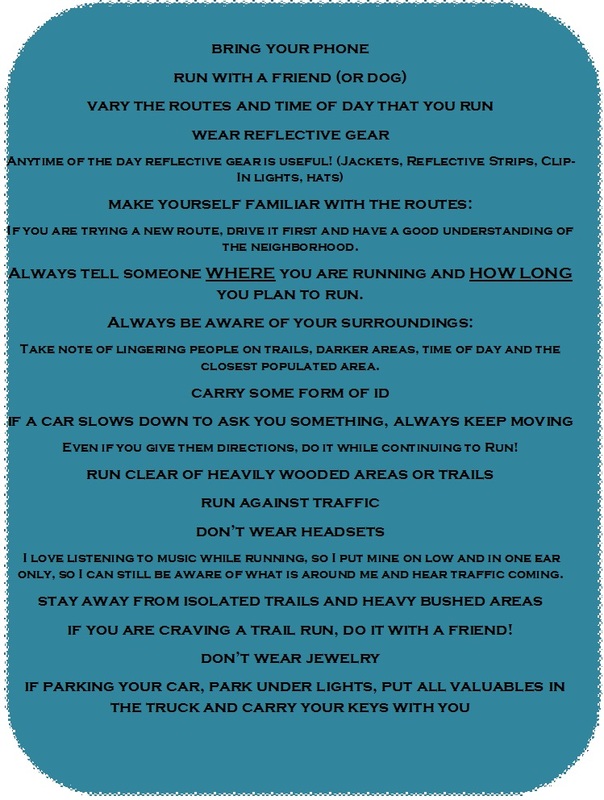 Love your tips on runner safety. Very helpful! Thanks! It's great to have this info in one place!